I recently loaned my copy of Sergeant Piggy's Lonely Hearts Club Comic, a reprint collection of Stephan Pastis' Pearls Before Swine, to my pal Jim Ivey. I remarked to him that I really loved what Pastis did in the book; he wrote short comments to go along with many of the strips. 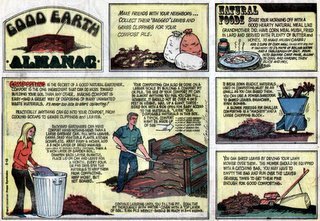 I think all comic strip reprint books would really benefit from such a feature, or at the very least give fans a reason to buy the books as opposed to reading the strip's archives online. 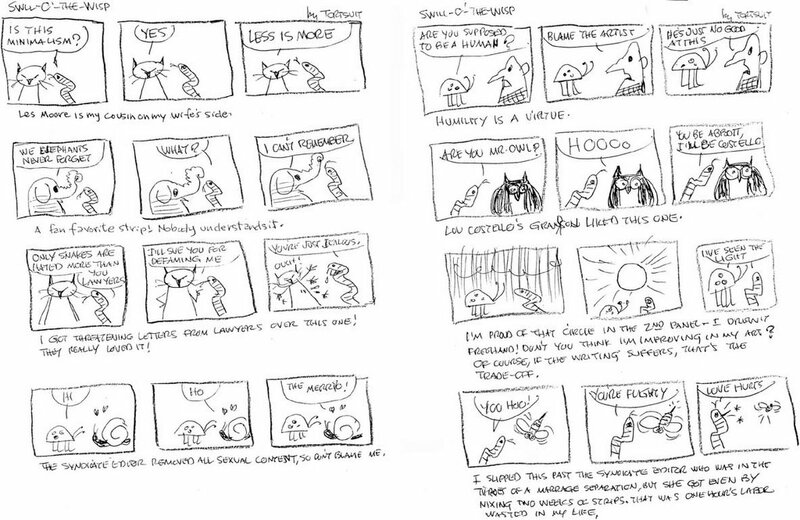 Anyway, Jim read the book and in reaction did the above doodled satire of the strip collection's commentary. Jim's takeoff strip is called Swill o' the Wisp. If you haven't read the reprint book you probably won't get much of the humor here, but hey, Pearls Before Swine is a pretty good strip, and the reprint book is pretty cool, so go buy it. Then come back and yuck it up with the rest of us. In the first decade of the century, when many comic strips were locally produced and not written with syndication in mind, minor gems like Uncle Billy weren’t uncommon. Uncle Billy was produced by a Philadelphian for Philadelphians; many of the jokes would be unintelligible to anyone outside the city. Our sample, for instance, assumes a familiarity with the Philadelphia City Hall complex. The strip was produced by one Jack Smith, and I have no records for him outside of this feature unless he’s the same Jack Smith that produced Daddy Dusk, The Sandman two decades later for the Graphic Syndicate. Seems like an outside chance. 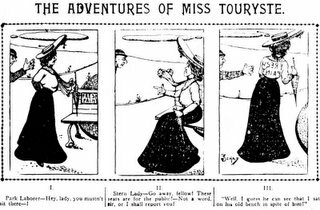 The strip ran in the Sunday Philadelphia Bulletin from August 5 to October 14 1906. A Mystery Strip - Can You Help? Comic strip writer and Stripper's Guide reader Jay Maeder has a question for you. He has the original art to a Sunday comic strip titled Wow, Wanda! by Dale Messick, creator of Brenda Starr. Neither he nor I have ever seen a strip of that title published, so he's hoping that someone out there may recognize it and tell us where it appeared. 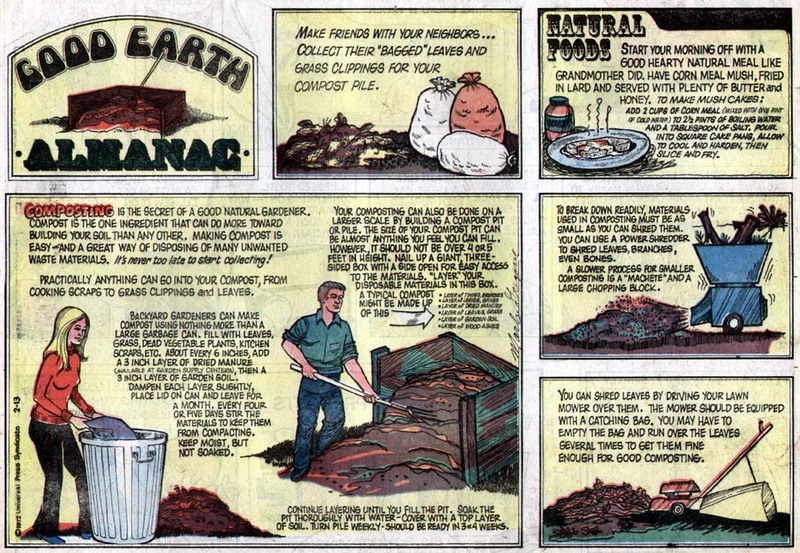 The strip is dated June 25 with no year indicated. Jay thinks that the style and content point to it having been produced in the late 1960s (I'll add that June 25th was a Sunday in 1961, 1967 and 1972). Jay didn't mention it having a syndicate stamp on it, so I'm assuming it didn't. Jay has provided a scan of a portion of the artwork. The artwork included a colored overlay, so it was definitely meant to appear in color when printed. So what is this? My best guess is that it was a failed tryout strip, but typically tryout strips aren't dated, so that may be a bad guess. Can you help? Do you have mystery items that you'd like identified? Stripper's Guide is willing to help. Just two rules that I'd ask you to abide by. First, please do not send me huge attachments - I am on a dialup connection and they can take half a day to download. Keep your attachment under 500k or you will get a very snitty email in return. Second rule is that I will not answer requests asking for appraisals - don't ask me to estimate a value of your item so you can put it on eBay - put it up there and the final bid is the value of the item - very simple! Allan, my first thought was a reject from WOW What a Magazine, but it doesn't look like 1936. From the bit shown hard to tell, but it seems a bit over the top for US syndication. As a guess I'd say it was either intended for a weekly magazine or overseas syndication. That's just guess of course. As I discussed a few posts ago, my quest for the locally produced 1904 San Francisco Bulletin Sunday comics was in vain as the microfilmer did not bother to film the Sunday comic sections. However, the film was not a complete and total loss, because here we have examples of two locally produced dailies that ran in the Bulletin that year. The only ones in fact. Although the paper did have daily cartoons throughout the year, and by important creators at that, they were almost always used to illustrate humor and verse columns. That means they don't qualify for Stripper's Guide as that places them squarely in the realm of illustrations rather than comics. 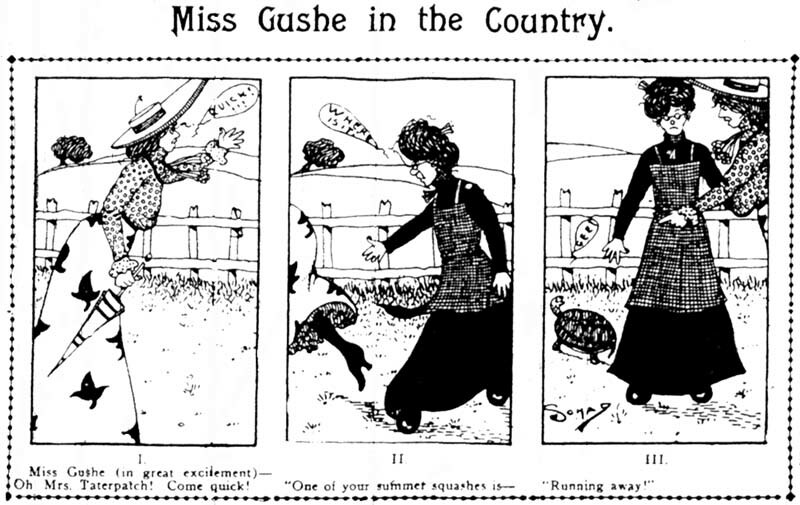 Our samples today are of Miss Gushe In The Country and The Adventures Of Miss Touryste, both of which ran daily for one week apiece in April and May of 1904. They're both by someone who signed himself Schad. Classics of comic strip humor they definitely are not. By the way, as I mentioned, a few important creators had work regularly appearing in the Bulletin in 1904. At the beginning of the year Thomas 'Tad' Dorgan supplied lots of cartoons until he was called to the big leagues in New York. 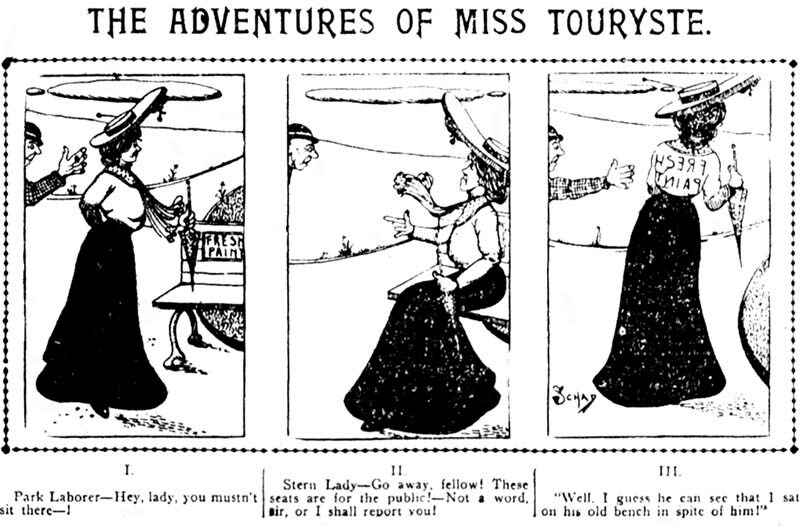 At the end of the year Russ Westover, of future Tillie The Toiler fame, started doing panel cartoons for the paper. Neither did a continuing strip for the paper in 1904. The success of the feature mirrored the popularity of the ecology movement itself. It started out in a lot of papers at its debut 11/21/1971, but seemed to lose its head of steam in the mid-70s. In my memory the ecology movement was similarly losing the focused attention of the public about that time (which is more interesting, mulching or disco? Oh, wait, they're both just recycled garbage). By 1976 or so the feature was running in very few venues. Anyhoo, the feature may also have been losing popularity because of the inherent limits of the subject matter. I mean, how many interesting ways are there to admonish people to use white toilet paper instead of the colored stuff? How many tips do we need on how to set up our own indoor herb (or even 'herb') gardens? in other words, the feature was probably getting pretty repetitive, and that doesn't fly too well on the comics page unless you're Andy Capp. The feature ended sometime in 1981 (can anyone supply a specific date?). But who is this Mark Gregory? for Monte Burch as writer and Don Carlton (yes, that Don Carlton) as artist. things outdoors and of the fix-it genre. lasted "five or six years". Kansas City, home to UPS. Wow! That is one hellacious bit of detective work, DD! Thanks for digging up all that data. And thanks also, for mentioning the Richard Lumpkin credit, I forgot to mention that in the post. In light of the Mark Gregory pseudonym, seems pretty reasonable to assume that we have another house name there. hi! i came across this while searching info on 'richard lumpkin' in reference to a sculpture that he apparently created that now stands in Prairie Village in Kansas (kansas city?) anyway, i'm guessing that considering that you put the other person as living in kansas, i'm guessing that since Lumpkin had a commercial art studio there that was (apparently) well known, it's not a far bet to say that they knew each other. also, the sculpture i was hunting (Prairie Boy) was (as far as i can tell) sculpted in 1971, and donated in the same year. hers is the 3rd name down- Muriel E. Brown Lumpkin. San Francisco Bulletin Sundays - Lost? Hello and good Monday to you! I went on a weekend research trip to the University of Florida and got a lot done. The Gainesville Sun paper filled in a few question marks in my 1930s AP syndicate material. Sadly they didn't run the complete service so I'm still looking for a way to index the interesting but rarely used Puffy The Pig feature. The Sun also ran Pieces Of Eight, another very hard to find strip. 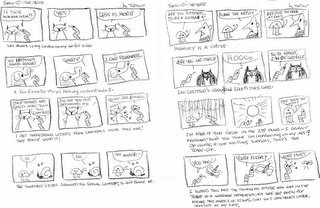 I was thrilled to be able to document that Burne Hogarth really did do the last two months of the strip. Leonardo de Sa had earlier told me about this but the Sun is the first paper I've actually seen that ran it to the bitter end (12/28/1935). Sorry I have no examples of the Hogarth material to show you - the microfilm viewer I was using had no printing capability. On an unhappy note, I also had the opportunity to finally get in the 1904 San Fransisco Bulletin microfilm through inter-library loan. I know for a fact that they ran their own Sunday comics in 1904 because a few pages have been auctioned on eBay over the past decade. Unfortunately in both cases I got outbid by a collector who goes by gabillard-fr. Also unfortunately, the microfilm (from the California State Library) is also missing the Sunday comic sections. That means that they are now lost irretrievably to history unless by some small miracle someone has saved a file of them. Can anyone help?